Every dollar contributed to this fund goes directly to personalized nutritional, dental and medical care for every cat entrusted to our care. 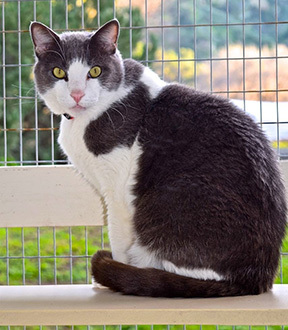 The Community Cat Fund underwrites the expense of our Lifetime Care Program for senior, un-adoptable cats that are accepted for residence to Blue Bell from local animal shelters. Contributions to this fund help us transform our property into Blue Bell Gardens which will create and sustain a rich habitat for birds, butterflies and bees; enhance the ecology, conserve water and provide Blue Bell’s cats, staff, volunteers and visitors with stimulating new vistas. Plans call for ten unique gardens showcasing local flora and fauna and sculptures by local artists. A contribution to Blue Bell’s endowment fund, helps assure we will be able to serve future generations of cats and their owners as well as allowing you to leave a personal legacy by helping perpetually fund a cause you care about deeply. Our Gifts of Love program allows you to make a tax-deductible donation in honor of a loved one to celebrate a special occasion or to honor their memory. A card announcing your donation (without mentioning the amount) will be sent to the person you are honoring. You will receive a receipt acknowledging your thoughtful contribution. Gifts of Love Instructions: For online donations through PayPal using regular mail, please send us a copy of your email receipt to Blue Bell Gifts of Love at 20982 Laguna Canyon Road, Laguna Beach, CA. 92651. Be sure to include your name, address and name, address and occasion of your recipient. By email: forward your PayPal receipt to info@bluebellcats.org including your name, address and the name, address and occasion of your recipient. If you have other questions please call us at 949-494-1586.